Oops - we don't appear to have a video for the DR-7580. We remain very pleased with the DR-7580. It is a quick, robust and reliable machine that meets our needs. Also it was competitively priced. We use it for bulk scanning of large files into our document management system and the scanner has allowed us to do this efficiently. We have scanned over 850,000 documents since we bought the scanner. At the same time as purchasing the DR-7580, we received a DR-2050C bundled with it. This is a ‘personal scanner’. We operated a Panasonic for small items (daily mail) but as that recently hit a snag, I installed the DR-2050C instead. To substantially increase document scanning speeds, the Canon DR-7580 document management scanner features on-board JPEG compression and a new CIS (Contact Image Sensor). As a result, it attains speeds that reach right up to 75 ppm in black and white/greyscale mode (A4 portrait, 200 dpi) . Plus, with a maximum 150 ipm for fast duplexing, the DR-7580 offers unparalleled production productivity. 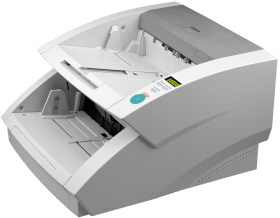 For high quality document scanning, the DR-7580 delivers an output resolution up to 600 x 600 dpi. Advanced text enhancement improves the legibility of light text, and a dual light sensor system prevents wrinkle shades on a document appearing on the scanned image. The DR-7580 is well equipped for use in a wide range of business applications. It is capable of scanning up to A3 size, and can handle different paper formats and thicknesses in mixed batches providing the flexibility required for all types of environments. The DR-7580 utilises a new feeding mechanism, combined with Canon's strong and durable original retard roller system. This allows the scanner to accept a wider range of paper thicknesses and provides even more reliable paper feeding performance.